Cold Brewed Coffee is One Hot Drink! 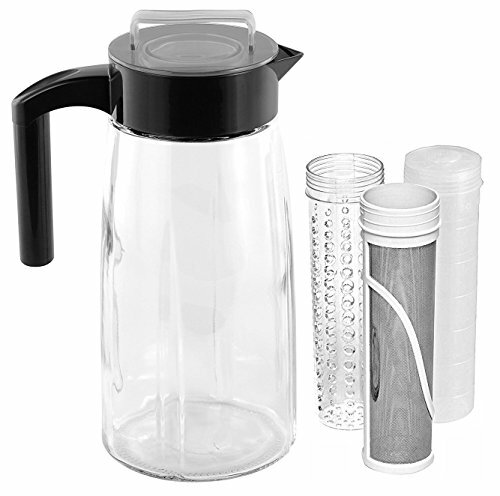 Coffee aficionados know cold brewing is the best way to make a delectable cup of java. It takes a little bit of time, but the results are well worth the wait. The glass Cooking Upgrades Cold Brew Coffee Maker makes it easy - and delicious. Coffee gets its flavor from the oils and acids that are released when the coffee grounds are mixed with water. When coffee is brewed the traditional way with boiling water, these "solubles" deteriorate, giving the beverage a bitter, sour taste. The cold brewing process delivers smooth, full-flavored coffee that is 67% less acidic than hot brewed coffee. Less acid means less stomach irritation, an unpleasant side effect for many coffee drinkers. With the Cooking Upgrades Cold Brew Coffee Maker, simply add your favorite ground coffee to the carafe along with cold (or room temperature) water. Seal with the airtight lid and refrigerate for 12-24 hours. The ultra-fine mesh filter keeps the grounds out and the flavor in. The Coffee Maker produces a rich, sweet coffee concentrate that can be diluted with water, milk, or ice to make a variety of amazing coffee drinks that can be served iced or hot. In addition to making incredible coffee, the Cold Brew Coffee Maker can be used to brew tea. Use the bonus infuser insert to create refreshing fruit waters. The free ice pack will keep your drinks well chilled for serving. The Cold Brew Coffee maker is made from 100% BPA-free borosilicate glass and is dishwasher safe (use the top rack for the silicone seal, filter, and infuser insert). Give up expensive coffee house beverages and brew your own. Order the Cold Brew Coffee Maker today! Instructions are included in the pictures of this listing! BE YOUR OWN BARISTA - Make your own café-quality beverages with the Cooking Upgrades Cold Brew Iced Coffee Maker, to be served iced or hot. RICH, SMOOTH, AND MELLOW - The cold brew process yields a coffee concentrate that is over 60% less acidic than traditionally brewed coffee, so it's gentler on your stomach. Rather than a bitter brew, you'll enjoy a full-bodied beverage that's slightly sweet with fruity, nutty, and chocolate undertones. NOT JUST FOR COFFEE - Use your Cold Brew Coffee Maker to create delectable fruit-infused waters, lemonade, and juices with the free infuser insert. The pitcher can also be used to brew your favorite tea. Keep drinks well-chilled with the bonus ice pack. IT'S ABOUT TIME - Cold press coffee is made with cold or room temperature water. It may take a while (12-24 hours), but it's worth the wait! Plus, the brewed coffee will stay fresh in the refrigerator for up to two weeks. The extra-fine mesh filter ensures your coffee is grit-free. EASY-TO-USE, EASY-TO-CLEAN - This brewing carafe is made from 100% lightweight BPA-free borosilicate glass, so your beverages remain chemical free. The pitcher should be hand washed (the leak-proof seal, filter, and infuser, can be washed in the top rack of a dishwasher). The coffee maker's slim profile will fit into most refrigerator doors. If you have any questions about this product by Cooking Upgrades, contact us by completing and submitting the form below. If you are looking for a specif part number, please include it with your message.